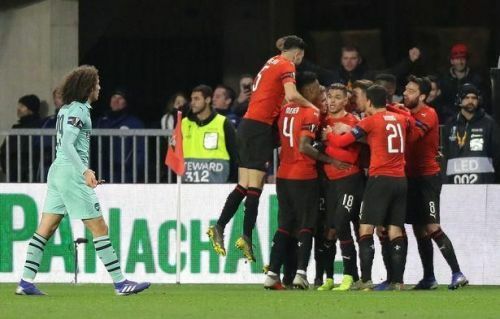 Rennes dealt a huge dent in Arsenal’s European adventure with a convincing 3-1 victory over the Gunners. Arsenal got off to a perfect start when Alex Iwobi scored in the 3rd minute and it looked as if it was a routine night for Unai Emery’s men. But things turned drastically around for the North London club when Sokratis Papastathapolous was shown a red card in the 41st minute. Benjamin Bourigeaud equalised for the hosts and after that, it was just one-way traffic with the home team enjoying the one-man advantage over the hapless Gunners. The second half showed many weaknesses in the Gunners' line up with a great resemblance to the Wenger era where no one on the pitch turned up to take leadership. Nacho Monreal was guilty of an own goal and Ismaila Sarr’s header in the dying minutes of the match gave a huge advantage to the French side going into the away match at the Emirates. Here are the three reasons why Arsenal was thrashed comprehensively. Sokratis got his first yellow for a lunge on Ben Arfa during the initial moments of the match. The tackle looked like a soft one, and on another day he could have just gotten a warning. The second was for a foul on Sarr whose fast runs were a nightmare for the Arsenal defence. Arsenal needed Sokratis’ leadership skills in the second half as the defence was completely opened by the Rennes forwards. But unluckily for Emery, there was no one around to plug the holes in the leaky defence. Koscielny was fighting a lone battle which was never enough on a tough European night. 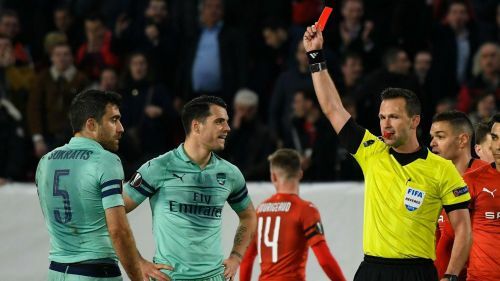 If Arsenal is not able to turn around the tie at the Emirates, the Sokratis red card will be one which will stay in the minds of fans for a long long time.